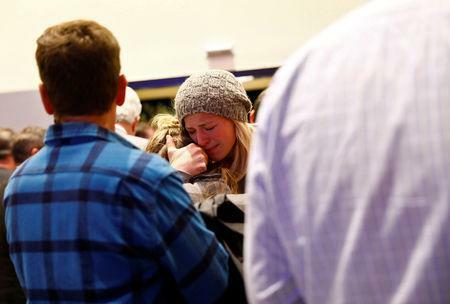 THOUSAND OAKS, Calif. (Reuters) - U.S. President Donald Trump said on Friday the gunman who killed 12 people in a crowded South California bar this week was a "very, very sick guy" and speculated the former U.S. Marine combat veteran could have been suffering from post-traumatic stress disorder. "He is a very sick puppy," Trump said of the gunman, speaking at the White House before leaving on a trip to Paris. Victims of Wednesday night's rampage in the city of Thousand Oaks included an 18-year-old freshman student at Pepperdine University, a security guard at the bar, a graduate of California Lutheran University and a Marine Corps veteran. Ian David Long, 28, walked into the Borderline Bar and Grill, which was packed with dancing college students, and opened fire, fatally shooting 12 people before apparently killing himself, law enforcement officials said. CNN reported that Long had written on Facebook around the time of the massacre: "I hope people call me insane ... wouldn't that just be a big ball of irony?" He added, "Yeah.. I'm insane, but the only thing you people do after these shootings is 'hopes and prayers'.. and wonder why these keep happening." Long's Facebook page appears to have since been deleted. The FBI was seeking a motive for the country's latest mass shooting. "He was a Marine, he was in the war, he served time, he saw some pretty bad things," Trump said. "And a lot of people say he had PTSD and it's a tough deal." Richard Berge, who lived near Long and looked after his mother's dogs, told Reuters she had told him earlier this year she worried her son might take his own life but did not fear he would hurt her. 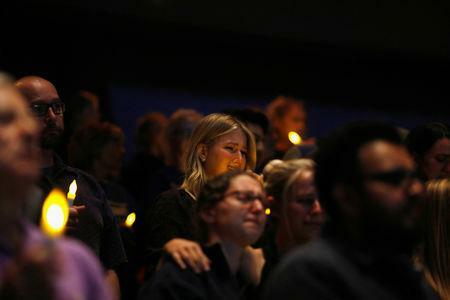 The Thousand Oaks massacre took place less than two weeks after a man shot dead 11 worshippers at a Pittsburgh synagogue, fuelling the debate over gun ownership in America. It was time for politicians to act, Orfanos' mother, Susan Schmidt-Orfanos, told ABC News. "I don't want prayers. I don't want thoughts," she said. "I want gun control and I hope to God nobody else sends me any more prayers." The wildfire that started on Thursday had destroyed some homes on the outskirts of Thousand Oaks and forced the mandatory evacuations of 75,000 people, as well as closing some highways. A large plume of smoke grew on the horizon to the northeast of the city. At a press conference, Linda Parks, a Ventura County supervisor whose district includes Thousand Oaks, noted the area was dealing with both the shooting and the fires. "We are still reeling, but we are also very resilient," she said. The fire near Thousand Oaks was one of three fast-moving wildfires burning in California on Friday morning. Fierce winds were expected to keep fanning the flames during the day. Although mass shootings have become part of the fabric of modern American life, it was a shock for this city, a sprawling suburb of 127,000 people that was named the third safest city in the United States for 2018 by the Niche research company. Heather Wynalda, 47, in Conejo Valley, a few miles west of Thousand Oaks, said her brother's home had burned but he and his family were safe. "It's just devastating," she said via Facebook messenger. "This community pulled together so beautifully in the midst of yesterday's shooting ... and today, it is being frantically scattered in an effort to escape the fires." 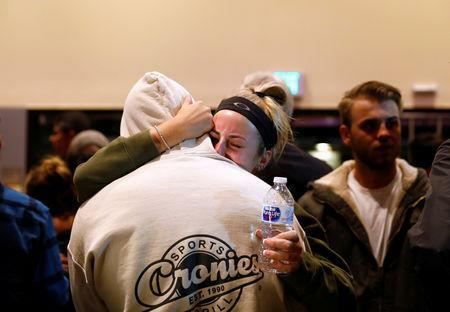 Evacuation centres have been set up in Thousand Oaks, including a teen centre where during Thursday frantic parents waited for news of their children after the shooting. Pepperdine University, which had held a prayer service in Malibu following the shooting, said Friday it was closing its Malibu and Calabasas campuses due to the wildfires.